The announcement that David Letterman is to resign in 2015 took by surprise only the most out-of-touch brain dead individuals, that is, Republican members of the House of Representatives. 10) Wanted to spend more time with his son while he could still throw a ball and, more importantly, remember what one is. 9) Top Ten lists have become so unfunny lately numbers 3 and 7 have been known to storm off the set. 8) Rupert G. constantly jacking up prices for corned beef whenever he sees Dave coming. 7) Late Night writers jumping at the chance to leave the show for Duck Dynasty. 6) Paul Shaffer and the CBS Orchestra making way too much money playing central Jersey Bar Mitzvahs to stick with this dead end gig. 5) Dave's gap tooth appears to be closing, wreaking havoc on his entire charisma. 4) Remember when Connie Chung and Dave had a special relationship and she used to be on the show all the time? Who the hell is Connie Chung? Exactly my point! 3) Abe Vigoda constantly asking everyone he sees "I don't look anywhere near as lousy as Dave, do I?" 2) Dave been mailing it in lately? CBS asks studio audience if they want material sent registered or certified before Dave even comes on stage. 1) Because Baby Boomers aren't already depressed enough about our icons biting the dust. 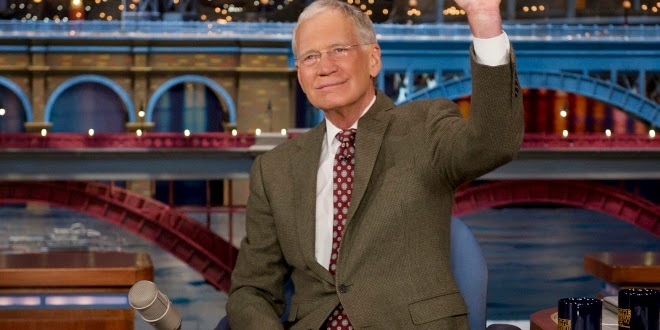 Despite this good-natured jab, David Letterman is an American original and true comedy legend. I hope he'll be around in other contexts for years to come. We will miss him. Well, then this is your lucky day! I was a fan for many years but for quite some time Dave's humor has seemed tired. That said, I hardly watch talk shows anymore. That said, I hardly do anything anymore! Thanks for writing, Patti. Great list, Perry. Who in the geriatric crowd can stay up that late anyway? I especially loved #6 and had wondered where Duck Dynasty was getting all their lame jokes. Never have seen Duck Dynasty but I'm told it's actually good. I'm afraid I MIGHT like it. As for Dave, he was great, but comedy - like the seasons - is cyclical. And when is it going to cyclical over to us?!! !